A stylish rendition of the ever classic paper calendars; a cube calendar makes a splashy desktop addition! The petite size of this cube calendar keeps its from distracting you and overtaking your work space. With its ever rotating cubes, the cube calendar will surely be able to keep track of your calendar dates for years to come! The cubes of this calendar indicate the month, day of week and date! Take a look at the picture below to have a clearer idea of how this cube calendar looks like! This cube calendar is a great promotional product to have because of the usability and the practicality. Furthermore, this cube calendar allows for your logo or message branding to stand out even more due to the contrast from its wooden texture and also the surface area available! The cubes of the calendars are made individually, so that just means more customization options! If there is a particular theme your company would like to follow for some event, you can always change the color and design of the cubes. For example, if your company has an upcoming environmental campaign, you can always redesign the cubes to be in green and brown color, and even emboss the design of a tree or your company’s logo! The above example is only one of endless number of variations you can choose from. 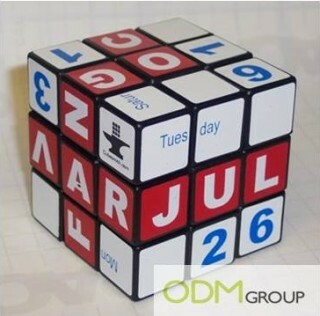 We at ODM highly recommend using this cube calendar as a gift for any environment campaign! It is a great way to uphold your company’s corporate social responsibility and boost your company’s image. So what are you waiting for? Contact ODM today so we can help brainstorm for you design ideas that can be in sync with your company’s theme for your next upcoming marketing campaign!